MULTIPURPOSE APRON: These versatile protective aprons can be used in butcheries, meat packing plants, oil refineries, factories, restaurant and caterer kitchens, manufacturing plants, or even at home. EASY TO CLEAN: After use, simply wipe down with a soapy washcloth and then rinse with a damp one. No need to throw it in the washing machine! Tough, durable and reusable, it is sure to be long lasting. ONE SIZE FITS ALL: At 39", or just over 3 feet in length, and 26" in width, this apron fits small and big builds and everything in between. Generously sized 30" tie straps allow for a customized adjustable fit. SAFETY AND COMFORT: Designed with comfortable straps at the back, this apron not only keeps you safe it is comfy to wear as well. 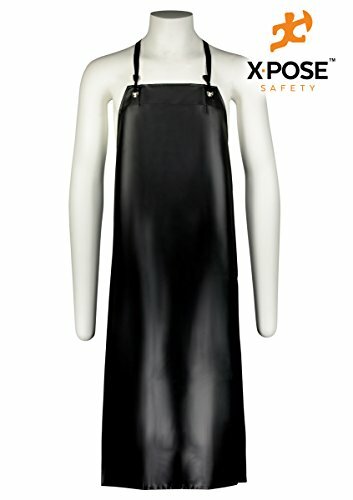 Add this commercial grade apron to your workplace protective gear.